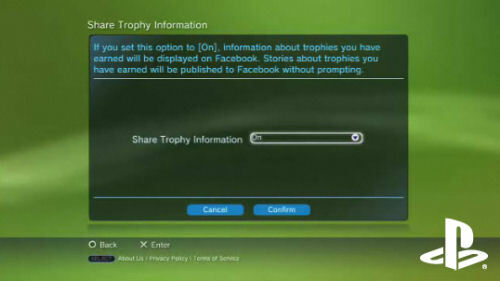 While Xbox 360 owners got their Facebook implementation yesterday, PlayStation 3 owners should get their update today. The Xbox 360 version of Facebook is used as a way to browse your friends, find gamertags, look at photos, and interact with the system. Sony took a slightly different route. Since the PS3 has a web browser, it was kind of silly to include a Facebook app. Instead, the PS3 is going to allow users to publish trophy info, PlayStation Store purchases, and eventually unique in game information once the developers get their hands on a new API. Also in this update is a revamped friends list (no more ugly boxes), and an updated photo browser that looks really slick. Page created in 0.5780 seconds.